Learn what the Glendale used cars experts at Auto Action have to say about safely traveling with your household pets in your vehicle. Nobody enjoys having to leave their beloved pet at home alone or pay the steep costs of an overnight kennel or a pet sitter. So why not take your pet with you on your travels? Along with your closest friends and family, be sure to pack up that pet crate the next time you hit the road for a vacation or road trip…but read the tips the Glendale used cars experts at Auto Action have first! Before you pack up everything, make sure you book an appointment with your local veterinarian to make sure that your pet is up to date on any shots or vaccinations. Make sure everything is taken care of and that your fluffy friend is healthy as can be. It’s also a good idea to ask your veterinarian for updated tags and medical records to have on hand while traveling. If your pet happens to get sick and you need to take a trip to a foreign veterinarian, these files will come in very handy. You know how important it is to make sure both you and your passengers are safely strapped in, so make sure your animals have the proper equipment such as a travel harness or crate in order the make sure your pet is secure and comfortable. As much as your pet may love riding around while freely roaming your vehicle and sticking their head out the window, this situation is not only dangerous for the animals’ safety but yours as well. Some animals may not like being in a moving vehicle for long periods of time. Help your pet get used to traveling long distances on the road so that they won’t be caught off guard or cause a ruckus when you finally set off for good. Think you’re good at going long periods of time in the car without taking a break for the bathroom or to stretch? Your animal probably thinks otherwise. Along with plenty of road snacks, it’s a good idea to take a break at least every 2 hours to get those legs stretched out and take a bathroom break at any nearest roadside station. Not only will your pet appreciate it, but you also may avoid having to clean up any sticky and unexpected backseat messes. Ready to hit the road? 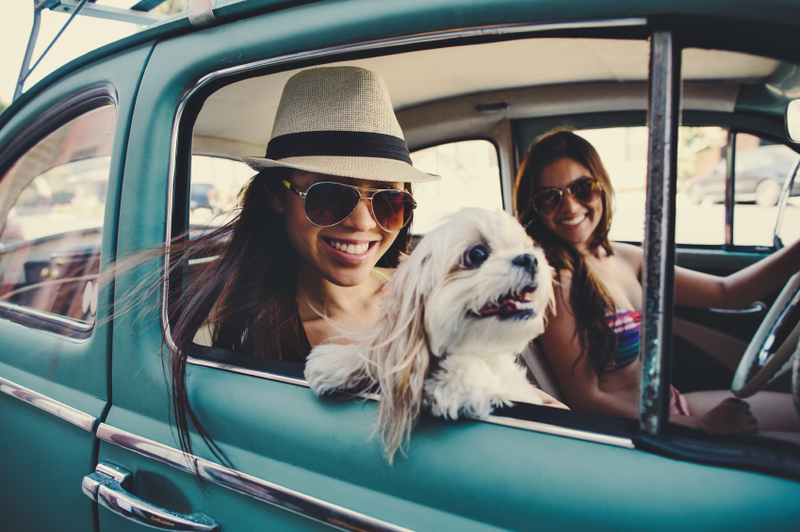 Let us know about your experience road tripping with your pet and if you have any advice for others in the future. Contact us through the form to the right.